I am so excited it's December. It's been a long year, very busy! This month I get to use some saved up vacation time which gives me a lot of time to play in my craft room! Good thing as I have not been able to make my Holiday cards yet! Only 7 more work days left for me and then I will be free for 2 and a half weeks! My cards may go out a little later than usual but they should still arrive in time. Anyway, my excitement can wait a few more days! 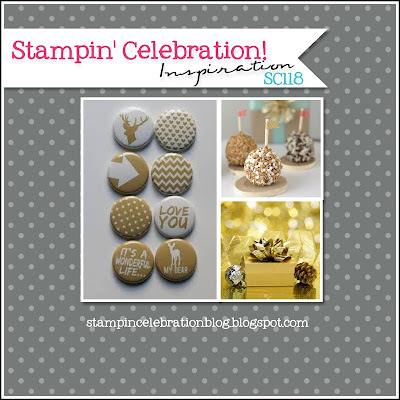 I love this month's inspiration challenge at Stampin Celebration! The buttons are adorable and I love the colors. For my project I used the buttons as inspiration! I kept the color combination at Very Vanilla and Kraft paper. I used the chevron (embossing folder) in the background and the deer head silhouette (not Stampin' Up!) in champagne glitter paper (retired). The greeting is from the Peaceful Wreath photopolymer stamp set. I love the simplicity of the card! Perfect for a busy season! Hope you get a chance to play along with this challenge! Looking forward to seeing what inspired you. And may you stay peaceful this holiday season!